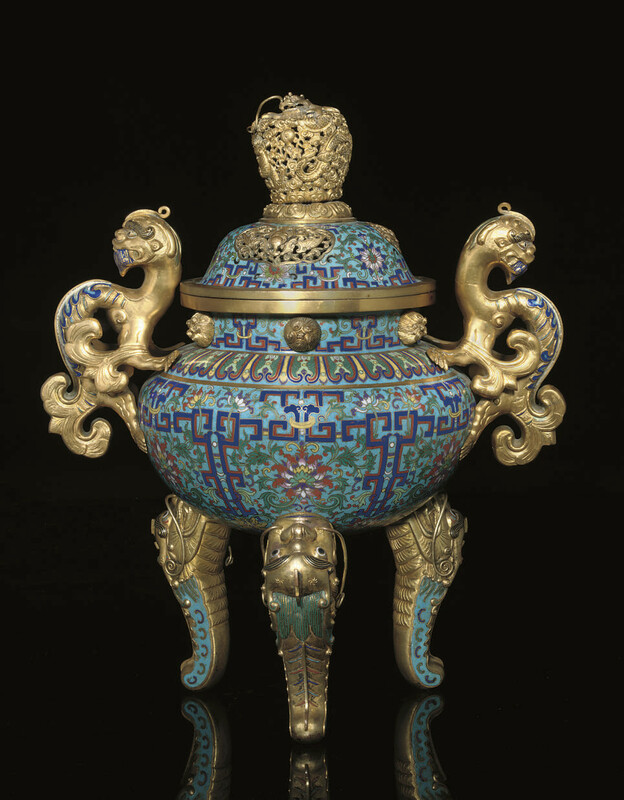 with twin gilt bronze handles in the form of chilong, each looking over their shoulders with a fierce expression, the body decorated in colourful enamels with scrolling lotus within geometric patterned borders on a turquoise ground, the tiered shoulder with a band of stylised petal motifs rising to the neck which supports staggered gilt nodes in the form of lotus pods, raised on three dragon heads, four-character mark to base reading 'Jingdu Decheng', the domed cover with three pierced ruyi-head cartouches depicting bat motifs to the interior, the high domed finial with a slender curling dragon amongst scrolling clouds, its head as the peak to the finial -- overall height, 18 1/8in. (46cm.) high.